For the average tourist, Chongqing is a place to kill time before a Three Gorges Cruise. 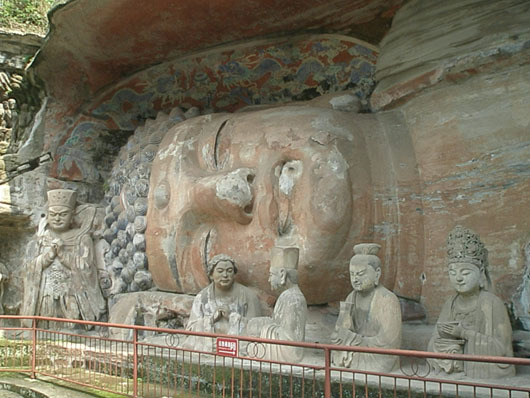 A pity, because there is so much more to the region – carved rock grottoes, natural splendours, and ancient towns. Featured here are three – excluding the Ancient Walled Town of Laitan – of the amazing world Heritage sites we explored from Chongqing. 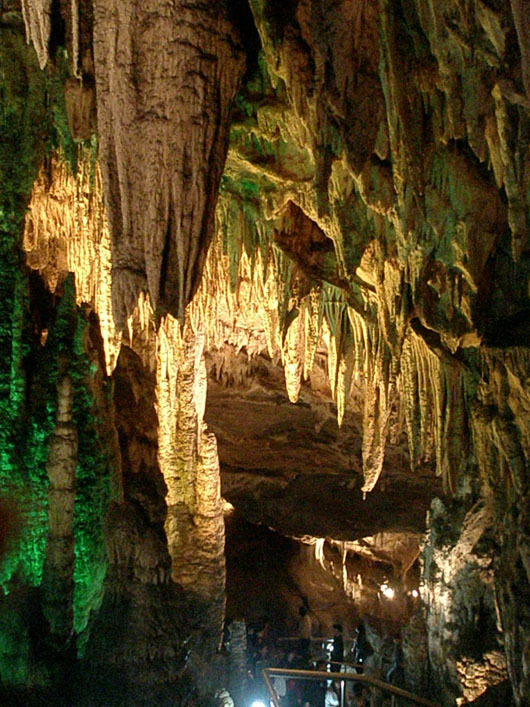 The journey to Wulong County through so many of the longest tunnels we had ever travelled through – one 21 kms long – was an experience in itself, and the stalagmites and stalactites in the Furong cave were surreal! 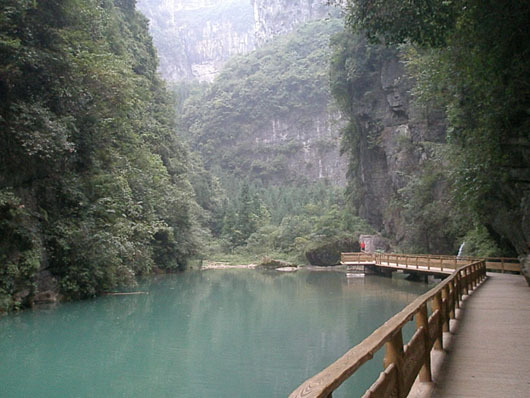 You can also zip line across the river Wu or catch a raft at the base of the cave & cruise along the river for three hours past beautiful scenery. The Natural Three Bridges, a rare geological wonder, is a karst stone arch bridge cluster said to be unrivalled elsewhere in Asia in terms of height and the breadth of the bridge surface. There have been a number of movies shot here as the scenery is so amazing. 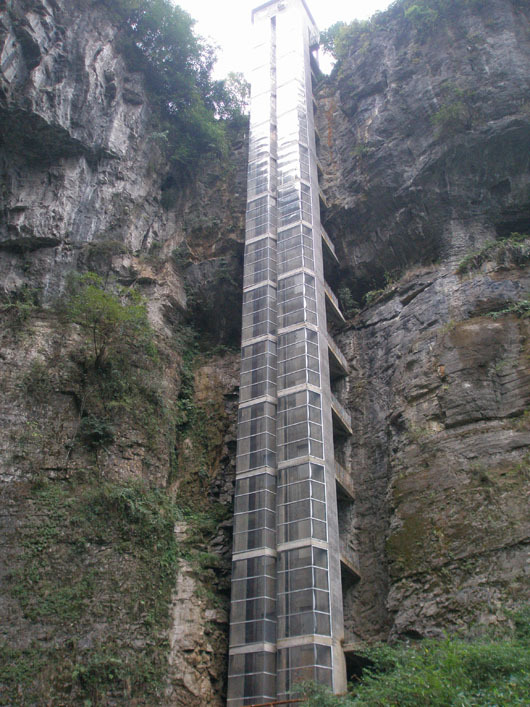 You descend to the bottom of the gorge in a glass elevator! From there it is a two hour trek through breathtaking scenery and then a thirty minute climb up some steps to reach the top again. 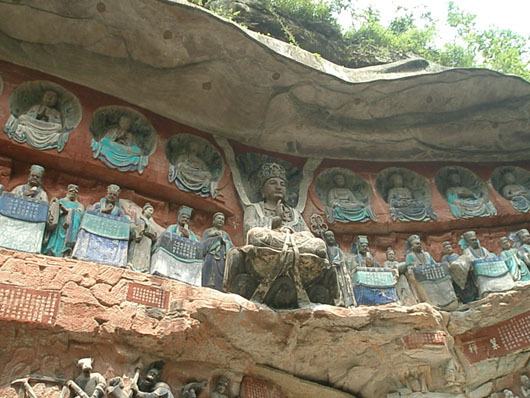 The Dazu Rock Caves – another UNESCO world heritage cluster – are located within the steep hillsides throughout Dazu County (located about 60 kilometers west of Chongqing). 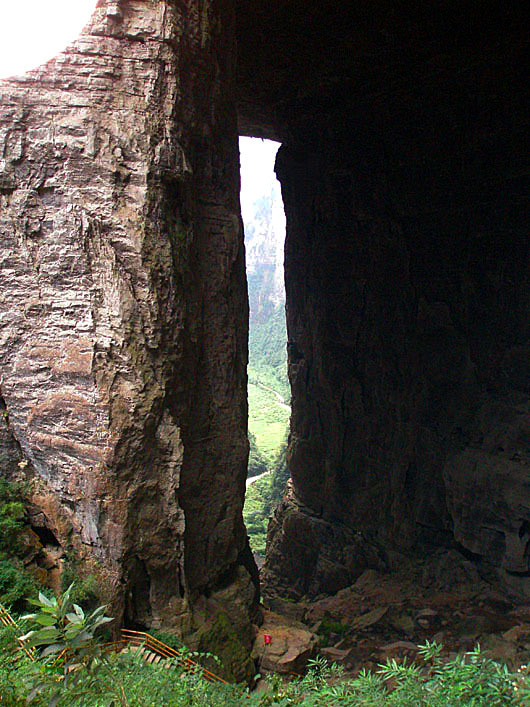 The more spectacular in Mount Baoding and Mount Beishan. At Baodingshan, you walk into a wooded area, just past the entrance and suddenly come upon this marvellous tableaux of vividly painted images carved into the mountainside! The images are from Buddhist scriptures based on Confucian and Daoist beliefs used as graphic moral instruction and as a code of conduct for illiterate masses. Carvings such as the ‘Wheel of Life’, the ‘Eighteen Hells’ and the 102 feet long reclining Buddha, are part of a treasure trove of about fifty thousand images beautifully illustrating the daily life of the Chinese between the ninth and thirteenth centuries. 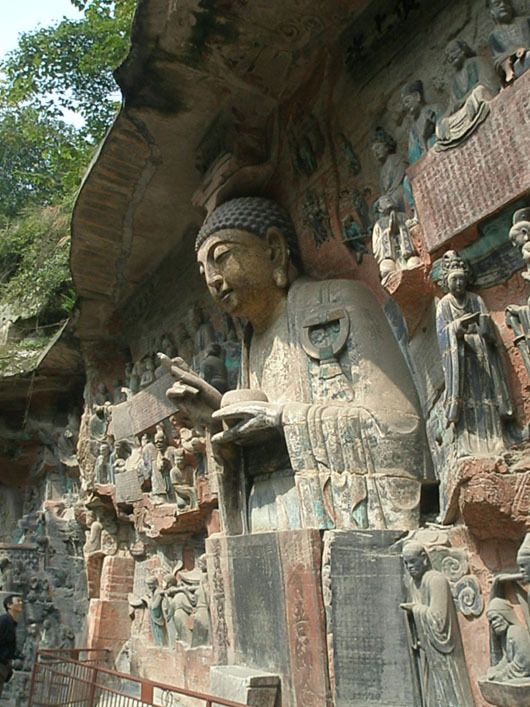 Until as recently as 1975, only a muddy path connected the town of Dazu with the main cluster of carvings. 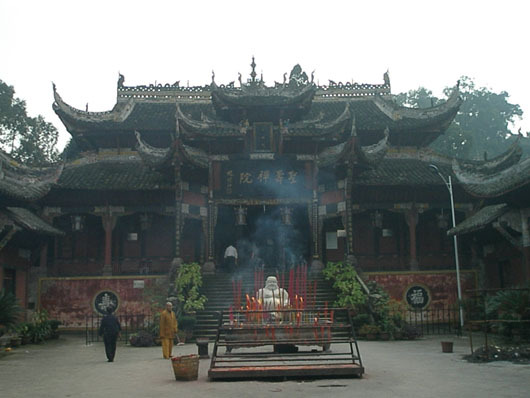 The isolation helped keep them unharmed during the massive anti-religious vandalism of the Cultural Revolution. 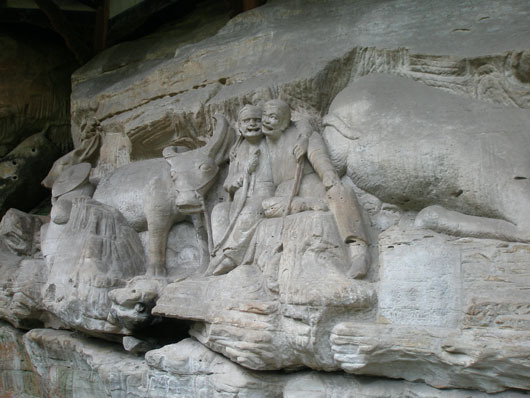 The carvings were granted World Heritage status in 1999. We were reluctant initially, to hike up several steps to the temple in Baoding, but the stunning golden statue of the 1000 hand Guanyin (Bhodhisatva, usually represented as a female) in the innermost sanctum was well worth the climb. China’s man made structures, throughout history, have been grand in scale. But her natural landscape is equally magnificent: Huanglong, Huangshan, Jiuzhaigou, Wuligyuan….the heritage list is long and we know that we have not begun to scratch the surface of what there is to see in this amazing country. Until next time…happy travels, no matter where life takes you! Thanks Madhu….this is now on my ‘Bucket List’. Very interesting photos. I really like the traditional religious art in East Asia. Chongqing is renowned in China for it’s spicy food and for allegedly having the hottest girls in the entire country. Yes the girls were beautiful and we loved the food in Chongqing, especially the fiery Hotpot and the insanely spicy Dan Dan noodles. I would return just for that! Just checked out your blog…were you aware that “The Curse of the Golden Flower” was shot in the Three Natural Bridges area? We picked up a copy but it didn’t work:-( Would you know if I can order one online someplace? Lovely blog Madhu – have so enjoyed reading it. Thank you Annie! Appreciate your saying so! Glad you like them Indra! Enjoyed visiting your blog as well! Thank you for your feedback and the follow! Stunning, to say the least. Thanks for your guided tour. Glad you liked the post Cris! Thanks for the feedback! Great photos. I love visiting caves. Thank you! New to blogging, so positive feedback is encouraging! Thank you for checking out my blog so thoroughly! Thanks again and all the best with whatever you are pursuing! Wow! What beautifulphotos! Thank you for this blog. Thank you Namita! The Chongqing region – Laitan in particular – was our favourite of the entire trip to China! Would love your feedback on Laitan…Its the first image under favourite posts on the right. You are most welcome Amy 🙂 Happy you liked it. This is absolutely astonishing! I would be wandering round all day with my jaw hanging open in amazement. What an incredibly rich collection of marvels. Wonderful! We did just that 🙂 It is surprising that most itineraries do not include this region. There are many more such wondrous places around! Thank you for your visit and comment. In a way perhaps it’s rather nice that they’re not included in most itineraries, because then when you find them it’s like a special little treasure of your own. Maybe they just have too many wonderful places! 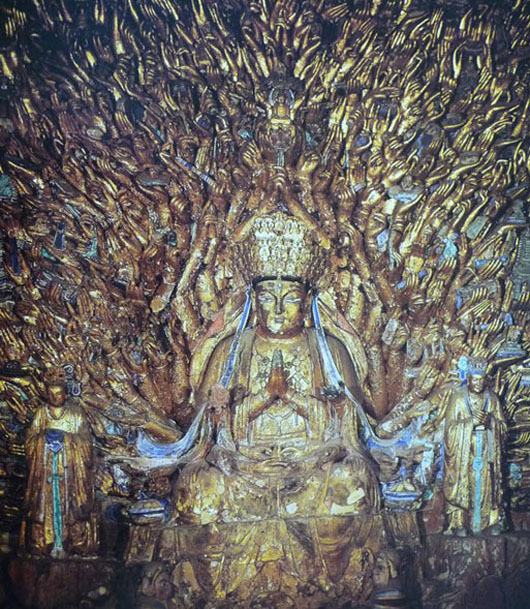 The 1000 hand Guanyin is one of the most extraordinary things I’ve ever seen. Were you able to learn anything about how the sculptors took the multi-handed symbol of deity, to arrive at this overwhelming, and unique, piece of art and religious iconography? “One Buddhist legend from the ‘Complete Tale of Guanyin and the Southern Seas’ presents Guanyin as vowing to never rest until she had freed all sentient beings from samsara or reincarnation. Despite strenuous effort, she realized that there were still many unhappy beings yet to be saved. After struggling to comprehend the needs of so many, her head split into eleven pieces. Amitabha Buddha, seeing her plight, gave her eleven heads with which to hear the cries of the suffering. Upon hearing these cries and comprehending them, Avalokitesvara attempted to reach out to all those who needed aid, but found that her two arms shattered into pieces. Once more, Amitabha came to her aid and appointed her a thousand arms with which to aid the many” !! What a lovely blog Madhu! I’m so glad I stumbled across it. Your photos are amazing. Apologies for the late response, Guess I forgot to check my old posts! Amazing photos – amazing textures. What I like about your interpretation of the theme is the portrayal of texture that is both of nature and man-made. The Buddha shots are my favourite. I can’t imagine a tunnel 21kms long, although I suppose it’s like our English channel tunnel but natural instead of man made. China is an amazing country and we are now able to see these wonders. The photos you took really take us right into the heart of this area. OMG !!!!!!!! Wow Madhu. Is there any place you haven’t been ??? That elevator would be the death of me. Awesome photos and great travelogue. I can’t wait to go. Okay it is official, I don’t thing blogging is a good idea for my travel list. I hope I grow very very old because I think I’ll need allot of time to cover all the lovely places. Thank you for sharing Madhu. I love all the photo’s it’s out of this world. Breathtaking photos, Madhu! Such a beautiful place. Amazing photos and experience. I’ve never been to pulled by the lure of China but I might just have to go after seeing this photos. What a great adventure it looks like you had. These are spectacular …. that elevator tickles my curiosity…. Somehow I missedpost this until now. O Madhu, your post is a wonder itself! I’ve never heard of any of these marvelous things you share with us, and they are truly extraordinary. The statuary is beautiful, the gigantic — natural and manmade –gives new meaning to the term. Even without the river cruise you have been saturated with wonders. And although I have long loved Kuan-yin, I never knew the legend you give of Avalokitesvara and the thousand heads. What joy you bring with your blogposts, I hope you are aware of it! WOW, how amazing. I would love to experience these wonders. Lucky you! You are lucky to have wander so much. 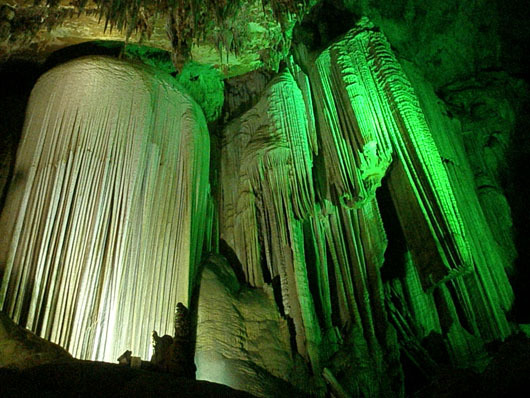 The caves reminded me of ” Bora Caves” Araku vally, Visakhapatnam. Photographs taken by you ? very nice. Fabulous pics Madhu. I just love all the Buddhas, and especially the pic of the Wheel of Life! Truly spectacular and the write up helps tremendously.